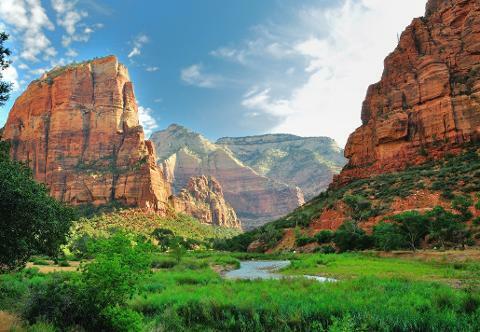 Spend a full day with us at Zion National Park, Utah's oldest of the five national parks and closest to Las Vegas. Only a 2.5-hour drive from Las Vegas, you will drive through The Mojave Desert and Moapa River Indian Reservation. After leaving Nevada, there is a short drive along Interstate 15 in Arizona known as The Virgin River Gorge. This stretch has remarkable views as you drive through the passageway that slices through the mountains. 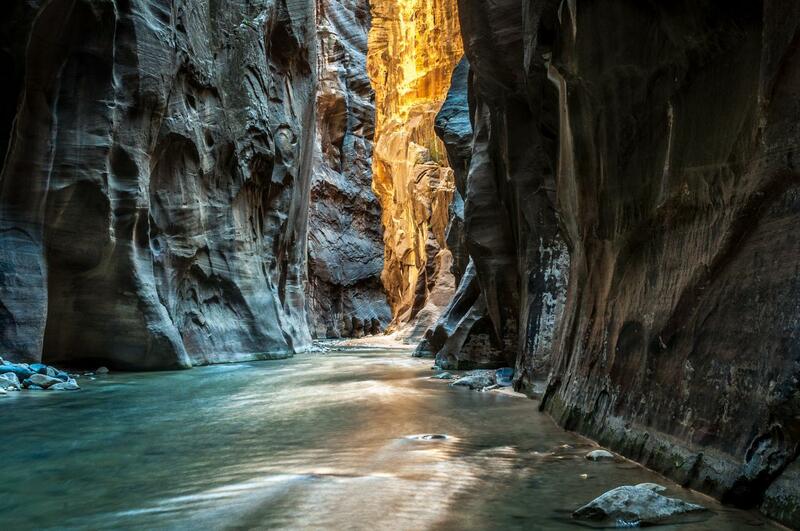 You will see limestone cliffs that are up to 500 feet above the highway as you follow the Virgin River. After exiting the gorge, it is a short distance before you will reach Utah. 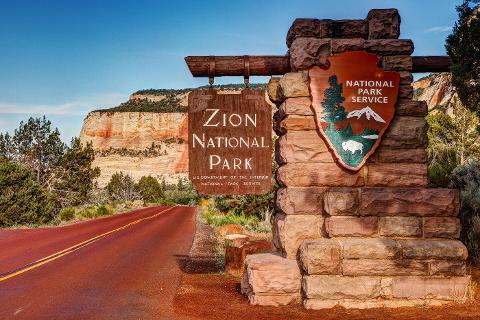 There will be a quick stop at a local sandwich shop (lunch is included) in Hurricane, Utah where pre-ordered lunch will be picked up to eat at the many beautiful places in Zion. After passing through the park entrance gate, there is a drive to Checkerboard Mesa via The Zion-Mount Carmel Tunnel. The next stop is at The Lodge. Get your "passport to your National Parks" stamped, pick up a few souvenirs or hike The Lower Emerald Pool Trail from here. 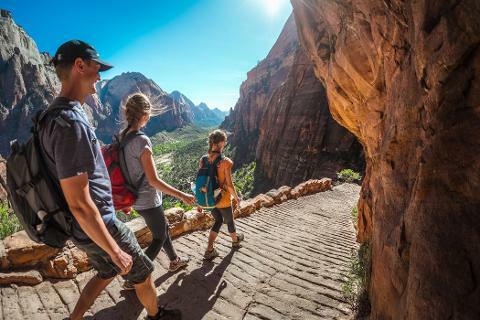 You can also take the free shuttle provided by the park to go to other hiking trails and locations throughout Zion. 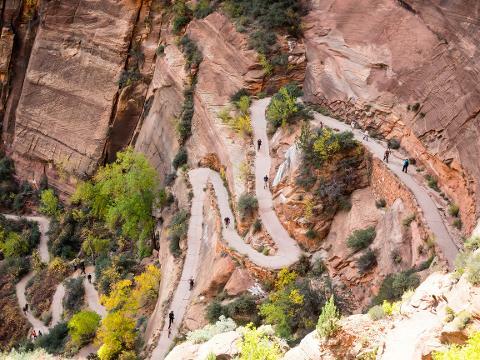 If you choose to hike The Riverside Walk (The Narrows) or Angels Landing, you will need to take the shuttle, unless it is off season, your tour guide will drive you there. 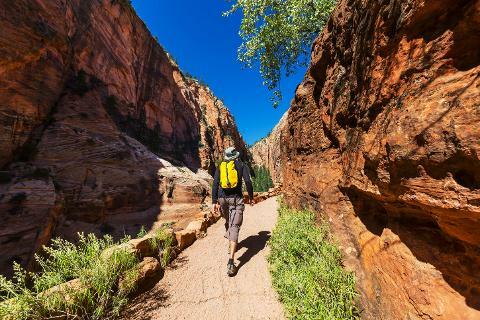 There are easy, moderate and strenuous hikes within Zion that you have time to do. 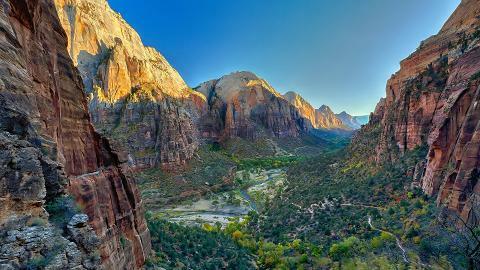 Your total time within Zion is 5 hours, which gives you plenty of time to explore this national park on your own. After leaving Zion, there will be a quick rest stop before reaching Las Vegas. Expected time of return to the first drop in Las Vegas is approximately 5:00 pm. Traffic or unforeseen circumstances may delay this time. Please do not make any reservations for shows, dinner or a flight close to expected return time. We are not responsible if you miss or are late to your reservation.